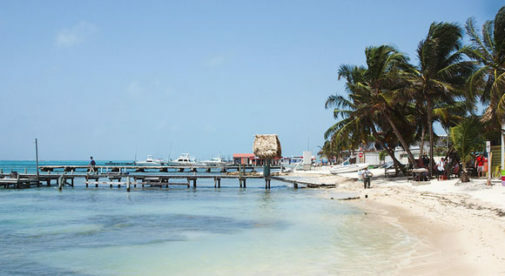 Even after living on Ambergris Caye in Belize for a dozen years, it still sounds like magic to my ears when I tell people my home is a tropical island. From the Caribbean coast and our stunning Meso-American Barrier Reef, to the mountains, Maya sites, and charming communities of the mainland…we have the best of worlds. When we grow tired of white, sandy-beach views we head to the jungle to hang out with the monkeys. For around $100 a night you can stay in a quaint jungle cottage with meals included, or forget the budget and splurge at a posh resort that caters to your every need. My husband, Ron, shares my passion for Belize and when—in 2004—we had the opportunity to purchase the island newspaper, The San Pedro Sun, we both knew this was our chance to live in a country we had grown to love. We pulled up stakes in Wyoming and permanently moved to San Pedro town with our teenage son. Although we both enjoyed our busy jobs—Ron as a PR and communications director for a national teachers union, and myself a campaign manager for a national health organization—we knew that there was more to life than the comforts of home. Living in the snow had lost its appeal. We quit our well-paying professions, rented our family home, held several garage sales, bought a house sight-unseen on the island and—with twelve trunks, our golden retriever, and a cat—we moved to the island in less than three months. Needless to say it wasn’t hard for my husband to trade in his 90-mile-a-day commute on icy roads for a one-mile bicycle ride on the beach to our office in town. You can get just about anything you want in San Pedro, but “gringo” food will cost you more. Eating like a local is not only delicious, but significantly cheaper than imported food. We love frequenting the local eateries and roadside stands, where you can buy a heaping plate of stew chicken, rice and beans…coleslaw and a tortilla…a yummy BBQ chicken with all the fixings….or some tasty Chinese food for $5. If you shop at the corner markets you can buy Belizean beer for just $1.50, and local products like tortilla chips, salsas, cheeses, meats, and breads are about half what you would pay for a U.S. brand. Roadside fruit and vegetable stands and independent seafood vendors offer the best prices, and it doesn’t take long to become well versed in “hunting and gathering” on your golf cart or bike for all of your favorite items from your favorite vendors. The cost of living varies on where you choose to live in Belize, with many expats enjoying a very affordable life on the mainland. Housing on the island ranges from nicer, one-bedroom apartments starting at $500 a month, to three-bedroom homes starting at $1,000 a month. Back in the early 80s my adventurous parents bought a beach house on Ambergris Caye. Several weeks each year we traveled from Colorado to enjoy the rustic castaway life of living in a house without electricity and hand-pumped well water. With each visit, my young heart was infused with the taste of salt water, the colors of tropical reef fish, and the broad smiles of children playing on the beach. The learning curve was huge the first couple of years, but now, as naturalized Belizeans, I’m happy to say we’ve got it more than figured out. Our vacation destination has switched now. Playing in the Wyoming snow is the go-to place; an island in the Caribbean is home.